One of the most important thing to know about the Halloween party is that it is a separate ticketed event. This means that your regular park admission will not get you access. 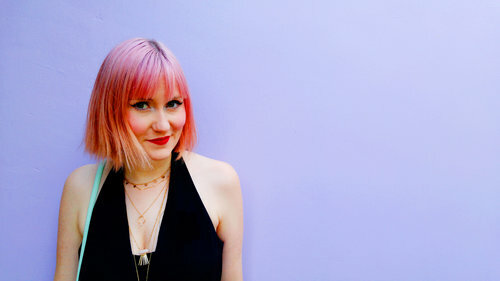 You need to purchase a dated ticket for a specific night. Knowing this in advance is great to keep in mind before planning your itinerary. If you're planning on visiting the Magic Kingdom for an entire day, ensure it does not fall on one of those party nights since you'll be kicked out at 6 pm for the Halloween Party paid visitors. On the flip side, if you don't need an entire day at the park, admission to the party will get you into Magic Kingdom for slightly less than regular park admission with almost the same access to rides and restaurants. There are only 20,000 tickets issued per night and while they don't always sell out, it's always advisable to purchase them in advance. The capped admission also means that they'll be less people in the park and if you're there for the rides, your wait times will be much shorter. Ticket prices start at $75 USD, with some dates over $100 per person. Weekends and holidays are often the most expensive days. If you purchase your ticket at least a day in advance you’ll save $10. Another reason to pre-plan is to ensure you arrive on one of those less expensive evenings. The is no difference in the actual activities. Typically the busiest night of the party is Halloween night, October 31st. The closer you get to Halloween, the more crowded the park becomes. Also, avoid holidays and weekends when lots of locals come to the party. Weekdays in early October, late September are your best option, although be warned, even in September/October the nights can still be very very hot, so keep that in mind. During the Halloween party guests are allowed to wear costumes, something which is banned during the rest of the year for adults. But there are some rules. For anyone over the age of 14, you need to make sure your costumes aren't inappropriate or could detract from other guests' experiences. This includes violent or provocative looking costumes. If you decide to dress up like your favourite Disney character (which had been prohibited in years past) all you need to make sure to do is not pose for pictures or sign autographs. This is to make sure guests don’t get you mixed up with the real character actors. You also need to be sure not to bring any toy weapons that resemble or could be mistaken for real weapons. For safety reasons due to the volume of people in the park be sure your costume does not drag on the ground. And no masks allowed. For children, some masks may be worn but they cannot cover the entire face, and eyes must be visible. Wearing a costume really gets you into spirit and is so much fun. We didn’t have the room in our suitcase to bring a character costumes but we wore a whole spooky-Disney inspired outfits and my old poison apple ears from Disneyland’s Halloween Party a few years ago went down a storm! Despite the fact that the ticket says "entry at 7 pm", you can actually enter the park as early as 4 pm through the main gate. This allows you 3 extra hours inside the park before the party kicks off. During this time, you won't be able to start trick-or-treating but it does allow you to go on lots of rides as regular day guests start to filter out. Although the ride times might not be as short as during the party, arriving early means you can check off a few experiences which aren't given a special Halloween treatment for the party or which might be out of way from where you’d like to remain during the party hours. There is so much to do during the party and lining up for rides might take away from your experience of the actual event. If you decided you wanted to come to the park during the day as well as the party at night (which would require a party ticket as well as regular park admission), anytime after 4 pm be sure to stop by "Ghost-services" to get a party wristband. This will denote to the staff you have paid to attend the party and you won't be escorted out of the park after 6 pm. For anyone simply entering after 4 pm with a party ticket, you'll also receive a wristband upon entry. In both cases, when picking up your wristband you'll also be provided with your trick-or-treat bag and your first fist-full of candy! Throughout the park, there are a dozens of Trick-or-Treat locations where guests can walk through various rides and locations to get their treats. While you are given a bag upon entry, many visitors bring their own due to the sheer volume of candy being given out, they really don't skimp. They give you giant handfuls of candy everywhere you go! And it's all name brand treats. If a line is short, you can go through it as many times as you want. Sure, as un adult, you could go out and buy your own, but there is something about trick-or-treating which makes you feel like a kid, and is just way more fun that buying it. That being said, while it is SUPER fun, I wouldn't recommend making that you're primary goal of the night. Sure it's great to nab candy at treat stations where there's no line but spending too much time waiting when there's so much more to do isn’t the best use of your time at the party. If you stay to the very end of the party, walk by treat locations on your way out. There is barely anyone in line and they absolutely fill your bag with the candy they’re trying to get rid of by the end of the night. Anything they don’t get rid of they need to lug back to the storage room so they’re more than happy to load you up! If you have a child with an allergy or if you yourself have an allergy, when you pick up your treat bags at the start of the night, ask for an "allergy friendly" bag. They teal blue bas indicate to cast members that you have an allergy and instead of the regular candy, they will give you a teal token which you can redeem later in the night. Head to one of two of the allergy redemption locations where you can exchange the tokens for your choice of a selection of allergy-friendly treats. While they are super high quality and delicious, there isn't a huge selection. But for kids who have severe allergies and who often feel like they can’t participate in events like this is a wonderful thing which Disney does. If although, your allergies aren’t too severe (for instance if you’re sensitive to gluten but don’t worry about cross contamination) it might be worth just getting the regular treats and then swapping with friends. I think you get more interesting candy that way. Unless you've made reservations far in advance, table service restaurants spots are hard to come by. While most counter service restaurants are still open, they get really busy during the party, so if you’ve arrived early, having dinner shortly arriving will also free you up to explore more of the park and then simply snack on speciality items throughout the night. During the party, there are exclusive food options available throughout the park. While this is a unique part of the experience, the overall reviews of these treats are pretty underwhelming and often these treats are more expensive due to their "exclusive nature". But there are some exceptions. The Maleficent Dessert at Storybook Treats is lime soft-serve inside a black waffle cone and topped with purple sugar and chocolate horns made to look like Maleficent. It's incredibly refreshing on a hot night and also wonderfully instagrammable. If you're looking for a cute souvenir, I would recommend one of the souvenir popcorn buckets. They make great Halloween decorations around the house and you get some delicious popcorn to boot. If you come to the parks year after year, these make for some of the sweetest mementos, especially if you love collecting Halloween decorations. The Mickey shaped cinnamon roll with chocolate spiderwebs is for sale in the in the Main street bakery and was my favourite treat. Unlike some other treats, this one is available all day, which probably means it's more of a solid bet. Another item available all day at the Main Street Bakery is the Not-So-Poison Apple Cupcake. This moist, spiced apple cupcake is topped with pecans and buttercream. Despite it being very rich, it is absolutely delicious and something you can easily share with four people. Main Street, U.S.A.: Mickey Mouse in his vampire costume. Storybook Circus: Minnie Mouse, Goofy, Donald Duck and Daisy (all dressed in Halloween costumes) and the Seven Dwarfs. The most popular characters this year were Jack and Sally and Moana. I heard that the lines for Moana was over 3 hours ! While I LOVE meeting characters and think it is one of the best things you can do in the park, I don't think its worth a 3-hour wait unless you've been to the party many times before or live in Orlando so you can attend on multiple nights. If you're really looking forward to meeting one character in particular, head there first, even before 7pm to see if there has been a line -up which has started to form. Another pro-tip is to see the characters during the parade times. Many people head down to get their spots for the the parades so this will reduce the wait greatly for specific characters. Pick either one of the parades to see and plan your characters visits around that. If you just want to see the characters and don’t need to meet them just walking around and taking pictures of the characters interacting with other people is also super enjoyable. We got to meet Ariel and Eric this year in their wedding attire and that was a really special one. The end of the night is when you’ll also find the lines to be much shorter but it’s risky since some characters head home for the night around 11 pm. There are a few rides which are uniquely entertaining during the party. Big Thunder Mountain and Splash Mountain don't have Halloween overlays but the views across the park with the Halloween lighting is beautiful to see from up high. Pirates of the Caribbean this year was given a bit of a lift when they started to use live actors. 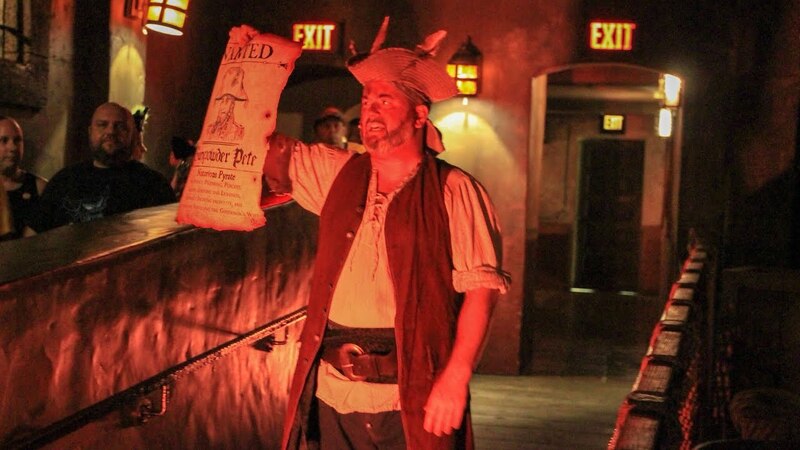 This actors would interact with riders while in line, warning them of a malicious pirate they were on the lookout for. When inside the ride, this pirate can be seen atop a bridge and his interactions with the people on the boats is great. It’s a small elements but another unique experience which makes this ride during the party all the more fun! The Mad Tea Party ride is definitely worth seeing later in the evening as they have special lighting and music as their Halloween overlay. It makes the ride a bit spookier and at the end of the night, it's pretty much a walk on. Space Mountain turns into Deep Space Mountain during the Halloween party and the ride is run in complete darkness. Paired with loud, rock music, it makes for a disorientating and yet exhilarating ride! Although I’m not a thrill rider myself, everyone who rode it said it was incredible and the big fans of Space Mountain said it was their favourite overlay ever. While the Haunted Mansion doesn't have an overlay per say, there are unique experiences to be had outside the house. All the staff gets extra spooky with their uniforms and the live ghosts entertaining guests outside the mansion are a wonderful way to pass the time while waiting in line. There are also some great photo opportunities beside the ghost-horse drawn hearse and beside the iconic “Haunted Mansion” entrance. The Hocus Pocus Villain Spooktacular is a MUST SEE performance. Three of the original Hocus Pocus witches perform live and are joined on stage by various infamous Disney villains. The show is so much fun, lots of moments to sing along to and get up and dance! As someone who is a HUGE ‘Hocus Pocus’ film fan, this was such a highlight for me. All the witches sounded and acted so much like the actors form the movie, it was like watching the movie come alive right in front of me. I couldn’t stop smiling the entire time. In 2018, the show was on four times a night at 7:40 pm, 8:35 pm, 10:45 pm and 12:00 pm. The midnight show is the one with the least crowds as many of the young guests have all gone home. It's the perfect finale to end an amazing evening. The Halloween Parade, titled Boo-To-You happens twice nightly at 9:15 pm and 11:15 pm (as of 2018). The parade route starts in Frontierland in front of Splash Mountain and makes it’s way through Liberty Square and then down Main Street. While Main Street might be the most iconic place to watch the parade Frontierland is actually my favourite place to watch since it starts there and therefore will be over first. You can use this extra time to get in a line up for a character or jump on a ride in no time. 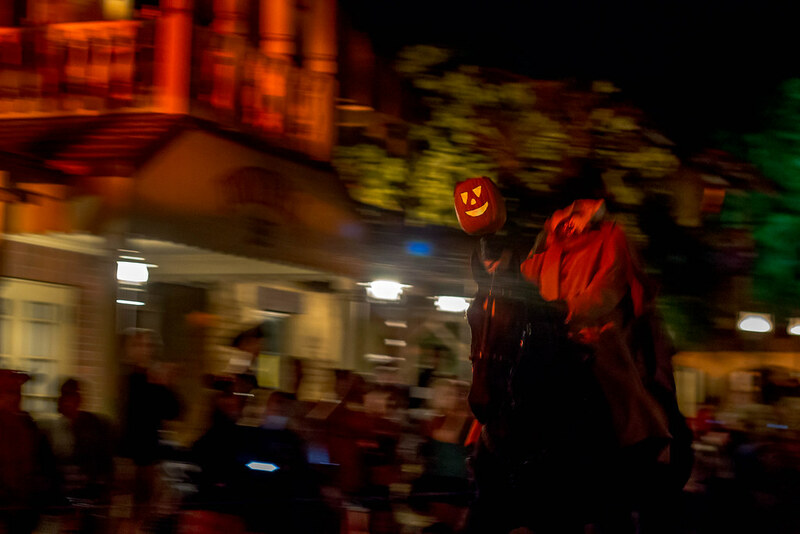 The headless horseman kicks off the parade by riding down the street on an actual horse with his glowing pumpkin head in hand. It’s one of those moment that feels like magic, like you’re seeing something not of this world. What a way to start the parade. The other floats contain some of your favourite characters in their Halloween costumes but there are also some floats unique to the party like the Haunted Mansions floats which feature the talking gravestones and the hitchhiking ghosts. There are of course all your favourite villains and some wonderful dancers and musical acts interspersed. All-in-all a wonderful spectacle! Front row seats are recommended since you can sometimes even interact with the characters as they pass by but for most nights which aren't sold out finding a spot even just 15 minutes before the parade starts will be the perfect amount of time to nab front row “seats”. The Happy HalloWishes fireworks show happens only once a night so you want to be sure to catch it! This year the show time was 10:15 pm. These are 360 degrees fireworks so anywhere along the main street right up to the castle will be a get location to watch. These fireworks are my favourite of all the various shows in DisneyWorld. The combination of classic Disney songs remixed with a modern twist, with interludes from some of your favourite villains is simply spook-tacular. Anywhere along Main Street up towards the castle is a great place to catch the show. Unlike the parade when you want to be close to the road, the fireworks are up high in the air so as long as you’re not blocked by a building or a tree, you’ll have a great view. You just don't want to catch yourself all the way in Frontierland moments before the show starts since they close down various pathways around the castle before the fireworks show for safety reasons. Throughout the party, there are some exclusive items for sale. These items are only on sale at four locations: Th Emporium, Curtain Call Souvenirs, Big Top Souvenirs and Frontier Trading Post. There are also wandering carts selling some items throughout the park. These tend to be things like light up necklaces and glow bracelets, items you could have easily purchased at target for a quarter of the price being charged at the park. I actually highly recommend doing! We bought two 12-packs of $1 glow bracelets and they went over a storm with everyone from our group. Helped save us spending $20 on some disney branded ones. On the flip side, there are some wonderful souvenirs which are unique to both your trip to Disney and the party itself. The Halloween party t-shirts are extremely popular and this year they even sold out of my size before the end of September! They are a great piece of memorabilia to remember your trip and the design is always beautiful. Other smaller items which you might consider picking up are the collectable pins only available on party nights. If you've purchased Memory Maker for your Disney Vacation, the Halloween party is one of your best opportunities to get some incredible shots. Throughout the park, there are exclusive photos locations as well as some hilarious and spooky magic shots! You can get a shot with the hitchhiking ghosts, make your own poison apple and even be surprised to find a ghost or two in your photos. If you're wondering whether or not the party is worth your time and money, I can't tell you more emphatically that YES, yes it is! I had wanted to go for many year but also debated at first, wondering if it would be worth it so I understand your hesitation. If you've visited a Magic Kingdom before this is a different perspective on the park which makes it feel brand new! Even if it's your first time at Magic Kingdom, what an introduction to the magic which Disney Imagineers can weave. Plus if you’re a super fan of the holiday, you get to celebrate it even if we’re weeks away from October 31st! Mickey's Not-So-Scary Halloween Party is a chance or adults to feel like kids again. You get to dress up, go trick-or-treating and meet your old movie heroes and villains. And if you’re a kid, nothing feel more like stepping into a dream. Except in this dream, you can take all those memories with you for years to come.